The hopes of an entire fanbase hang on the surgically-repaired right arm of Matt Harvey. 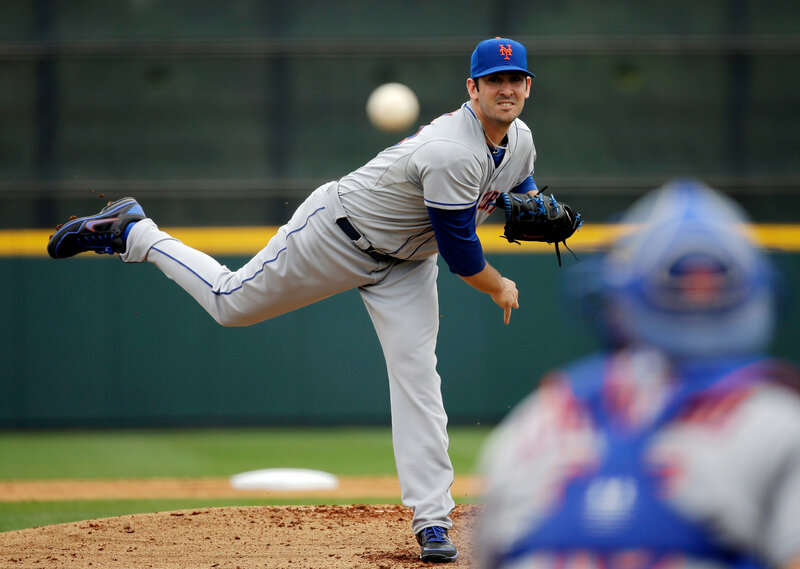 Mets star right-hander Matt Harvey may be getting close to his innings limit. Or he may not be. It’s hard to know who’s right here, but one thing’s for sure: The Harvey innings situation is a budding controversy and source of consternation at a time nearly everything seems right in the Mets’ world. The Mets, Harvey and agent Scott Boras are going to have to figure this out before too long, but so far they can’t even agree on who the disagreeing parties are. Mets GM Sandy Alderson contends he’s not going to let Boras determine Harvey’s innings; meanwhile, Boras says it’s not him but the doctors who are making the determination to limit Harvey to 180 innings, and the doctors are the ones the Mets have no choice but to abide. If Harvey has just two starts left this year, it’s hard to see how much, if any, playoff impact he might have. Is there anything more Mets than having a debate like this play out in public? The Mets are six games up in the National League East, the pitching staff is rolling along, even the anemic offensive lineup is somehow squeaking out enough runs per game to win. But sailing along easily to a division title, their first since 2006, would be too simple for this club. Let’s make something very clear here. The Mets are beloved by their faithful fans, but they have not been very good, especially in the shadow of the Yankees, the cross-town rival. The Mets have won just a pair of World Series titles (1969 and 1986), won the National League East division five times and appeared in the playoffs a total of seven times. Let’s repeat that. Since forming in 1962, the New York Metropolitans baseball club has only played past the regular season SEVEN times. So meaningful October baseball does not come around very often for those in Orange and Blue. Which raises the question, should you leverage what could potentially be Matt Harvey’s future for a chance to compete deep into the postseason? The Mets dealt with a similar situation to this in 2012. Should manager Terry Collins have let Johan Santana throw 134 pitches on his way to the only no-hitter in Mets history? No-han, er, Johan says yes, even though his career has never been the same. Terry Collins isn’t so sure. Immediate benefit versus long-term health. It’s an impossible question to answer. The Mets cannot pass up a chance for an October run this year. The fans have been through too much in the past 10 years to have the rug pulled out from under them. But you also can’t sacrifice the potential health of the best young pitcher in the sport and the face of your franchise for the next 5 to 10 years. Sure, studies have come out on both sides saying if pitch counts are better to rehabbing athletes, or that innings limits are meaningless, but the Nationals played it safe with Stephen Strasburg in 2012 and he’s been just as good as ever. Having said that, the Nats lost in the NLDS in 2012 and with Strasburg on the bump, could have possibly made or even won the World Series. As unenviable as the spot Terry Collins and general manager Sandy Alderson are in right now, I think holding Harvey back and limiting his innings is the right move. As hot as this Mets team has been, the roster just is not ready to win a World Series. I don’t think there’s enough offense and I’m not sure the young pitching can maintain a consistency through high-pressure October and November. While the age-old argument dictates that the window is open now and you need to capitalize, I would argue that saving Harvey and keeping the window open LONGER benefits the Mets way more as a franchise. I’m well aware that Harvey could pitch the Mets to the World Series, never suffer any repercussions and I’ll be trying to delete this post ASAP. And I certainly hope that happens. But knowing the Mets and their bumbling, inept leadership, I can’t imagine all the ways that this is going to end up going wrong and in the public view. This entry was posted on September 4, 2015 by Coach Sass in Miscellaneous.